Looking back to my first thoughts on this subject of Trees, I can see that my list of possible areas to paint was an intellectual response. But the experience I have had over these weeks has been entirely different. I decided that I was going to put everything else on hold for this final series of paintings and just immerse myself in the work. This was very hard work, much harder and more demanding than I had thought. The initial list seemed to be irrelevant, except as a starting point, and in some ways it led me down wrong tracks. The most significant thing was in “listening’ for the ideas! Each idea for the next painting emerged from the previous, not easily, and sometimes with quite a struggle. Images from photographs stimulated a thought sometimes, looking at artists’ work triggered a response and sometimes the paintings themselves nudged me into new possibilities. There were also times when I realized that my ideas were taking me into a direction which needed more depth of understanding and experience than I had at this time and I had to abandon these for future exploration. *In what areas does your work show progression? I feel that the main area where I can see progression is in abstraction. As I painted each image I could feel myself getting looser in the interpretation. I have left the paintings in the order in which I painted them and I think you can see this happening. I could have painted 5 scenes just like the first which is the most representational but I wanted to explore much deeper. Abstraction encourages me to get beyond the seeming reality of what the eyes perceives and find another reality. This was not difficult with the topic of Trees because I feel such a bond. What was difficult was how to put this down on paper in a meaningful image! *Did your use of colour, tone and composition improve? I’m not sure if it improved and I’m not sure I was thinking about it. Colour plays a huge part in how I see the landscape but it seems to be quite intuitive, possibly because it represents how I feel about it. Composition in regard to abstraction is still very new for me and so I have needed to think about it. I love the freedom abstraction gives and the release from perspective etc but I’m at the stage where I still like the abstract image to include some realistic features. This is not at all easy to achieve, I’ve found, and it does make me spend a lot of the time simply staring at the paper to see how to construct the composition. *Are there any interesting changes in how you applied the paint? The intense focus which this work has required of me had brought about much more confidence in using the paint. I realize how instinctive my painting has become and also the real enjoyment I have in the paint itself. I love seeing what it will do. I also have begun to work with a wide range of brushes and other means of applying the paint. I have used the sharpened end of sticks, my fingers, I have blown the paint through a straw and really enjoyed the introduction of other media with the paint. What has been interesting to me as I look at the series of paintings is how little I have actually used LINE! As you can see in my sketchbooks, drawing and line have been a dominant feature of my work through the course and I spent some time in the A3 sketchbook doing a personal investigation in how artists use line in their work. This was fascinating! But I always wanted to be sure that the line I was using was an expressive addition and not just an outline to give structure to the image. In this series, line has been used very little and only where it was needed in the creative process. To me this means that the creative use of paint has begun to take over! *How has painting in a series developed your style? This is a hard one to answer as it is difficult to know yourself in this way. My painting has become very intuitive in this series and consequently I think a style has begun to develop. I know that people looking at the work can see a style. I think the series helped this because there is something about a ‘flow’ of ideas and responses which takes the work far more into the subconscious. Personal style is an interesting subject. I look at many artists and there are so many that I truly love and I often wonder what is it that attracts me to these images. But it is also impossible to copy them. I’m pleased with this series of paintings. I am still only at Level 1 in my study and development and I’m very aware of how far there is still to go if I want to be a serious painter. But I feel at last that I’ve achieved a level of skill that I’m beginning to be happy with. As I look at them I feel I have been able to convey a genuine love for the subject and my individual language as a painter is beginning to show itself. This language is not conscious, in fact I’m quite surprised at the strength I can see in the work. I feel that a turning point happened with the painting of the RED TREE. It was one of those special experiences when I felt caught up in the creativity…as I’ve put in my Learning Log, the painting was done in a very urgent, spontaneous way. 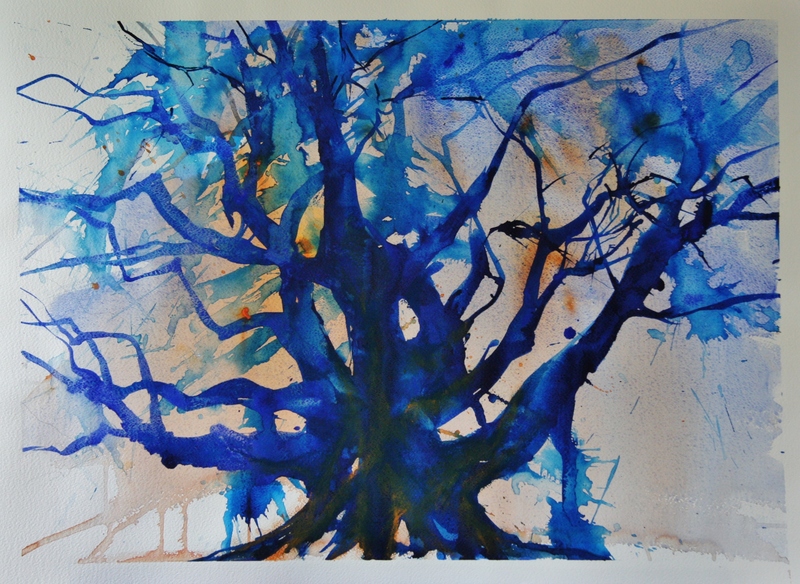 I loved the image of the old tree I was painting and the paint and the ink just flowed. I don’t think my ‘brain’ was engaged at all in the process – it was all from deep within. But the interesting thing which happened was on the following days. I simply couldn’t paint anything! There was nothing. Over and over again I tried to develop ideas which all came to nothing. And all my confidence went! It was only when I went back to digging deep into my feelings about the forest that an image began to appear and the work began to flow. The last three paintings for me represent a new way of working which I’m keen to develop. This is the final phase of Level I for me and as I look back I’m just amazed at the progress I’ve made. I can really feel myself becoming a painter! All of the three courses have challenged me for different reasons and I can see how there has been a steady buildup of skills and awareness during this time. The Watercolour Course has been especially rewarding for me and I’m glad to have ended this level with it. Because of the exquisite nature of the medium, it has pulled me away from my love of drawing and this I didn’t think would ever happen. Drawing comes easily to me and always has but I wanted to move on from this and express the same qualities in other ways. I’m also very aware of the careful and thoughtful way the courses have been put together. There have been times when I have railed against the emphasis on skills but now I am able to see the benefits gained from this. I no longer think about washes, blending, mixing etc, etc…they have become instinctive and what a joy that is! Perhaps in reading these final thoughts, you may think I’ve reached a complacency with my work. That is certainly not the case! There is so much more to learn about me and my visual language but at least I can finish here in the firm conviction that I am at last able TO CONTROL THE PAINT!! My last painting is in a larger format (A1) because I wanted to try to capture the amazing grandeur and breadth of the tree. I’ve never painted in watercolour on this size before but felt it was right for the subject. Even on this size I don’t feel to have been able to capture the vastness of these trees. I painted this image at the same speed that I had painted the Red Tree with no preliminary study. 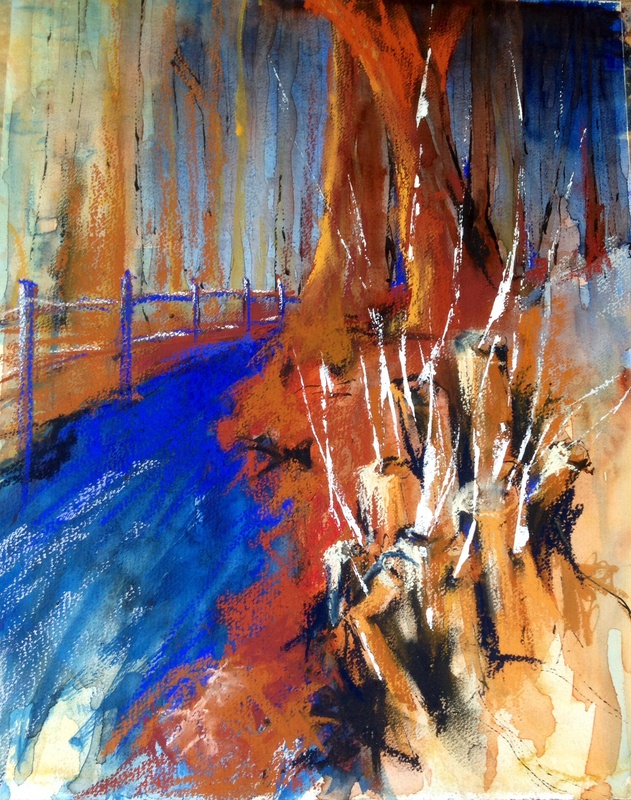 The image of the great Moreton Bay Fig was in my mind and with the help of photographs I simply enjoyed the experience, beginning first with a wash of cobalt blue with cadmium orange. With the image in front of me and using indigo and blue acrylic ink, I painted without looking at the paper! Once again the pace was frantic but exhilarating. When I felt to have captured the general shape I applied more water in splashes across the page and was delighted when the blue ink revealed a lovely green as it diluted. The sad thing was that the paper began to buckle with all of the water and formed a ridge down the centre of the tree where the paint stayed. I tried to rectify this but there was a limit to how much I could tilt the board because the painting was very wet. Managing this degree of wetness is obviously a skill! Looking at the painting the following day, I felt I had to get rid of the ridge of paint so very lightly I added touches of orange oil pastel to the trunk. I feel this has introduced a control which I’m not happy with…. but on the positive side, it brings a balance of orange tint to the foreground. 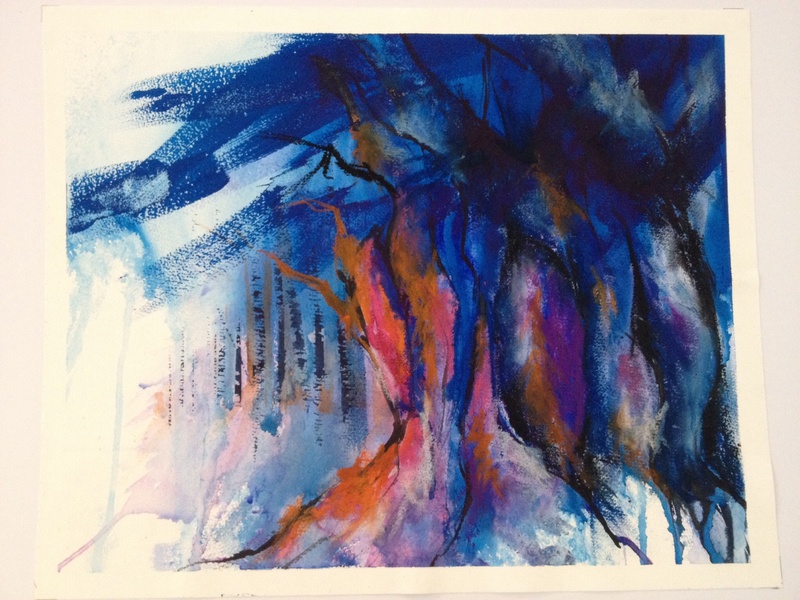 As I look at the painting now, I feel that the whole image is like a splash of paint thrown on the paper to form the wonderful fluid shape of a tree. I want to explore this idea mainly because of my own relationship to them. I’m not sure I understand the bond or where this will take me but I’m excited to try. I started by assembling images of trees with human figures in them and began my studies with drawing and painting from these images. After a day of this with no progress, I realized that this subject was not going to be an easy one. It was not just a matter of painting trees and adding a figure! That simply didn’t work. As I painted, I found that the forest environment can be a very threatening place when you place figures in it, particularly children. What was charming in a photo just didn’t transfer into a painting. Placing a child on its own amongst tall trees was a very uncomfortable image for me. So I obviously had to go far deeper into the subject. The second challenge I faced was how to paint the figure. I went back to this section of the course and felt that I didn’t really get to grips with it then. Like so many other topics, it presented a huge area of study for which there didn’t seem to be time in amongst everything else. I spent some time looking at how artists have used the figure in landscape…in particular, Kurt Jackson. In his book entitled, A New Genre in Landscape Painting, there is a chapter on Painting the Forest. Kurt Jackson is an environmentalist and so his interest and passion for the forest go far beyond just the picturesque. His paintings are very atmospheric and celebrate the forest as an environmental powerhouse in today’s world. It was interesting that the inclusion of people in his landscapes is rare and I could see why. This painting was becoming a huge challenge and after several days of unsatisfactory attempts I decided to abandon the inclusion of a figure. The subject of The Forest was also one which needed much exploration. Both of these subjects are ones which I would like to take up later but both need deeper exploration. So I went back to the exercises I had done on ancient trees and painted an image to try to capture the atmosphere of the forest. I’m pleased with the looseness of this image and feel that I have managed to capture something of what I felt. This painting grew out of a personal study I had been doing in my A3 sketchbook on how artists use LINE in their work. This study came about because of my ongoing interest in drawing. I looked at the work of several artists and began to see how LINE can be used expressively and not just as an outline. One of the artists I looked at was Andy Goldsworthy – I love his work in the landscape and saw his use of LINE in many of the sculptures as echoing the intricacies and delicacy of nature. A section of his work in his book, WOOD, concentrates on a vast, ancient oak tree and the images here reminded me of the images I saw in the Botanical Gardens in Sydney of ancient Moreton Bay Figs which are huge, sculptural trees with enormous roots and vast branches. These images all came together for me and I decided to try to express the beauty of these huge trees in all their grace and strength. Some preliminary planning was done in the sketchbook mainly in regard to textures and colour. The painting itself happened in 20 minutes of hectic creative activity – there seemed to be water, paint, inks coming together simultaneously…all flowing in together…with me trying to control yet not control, letting the paint flow into tree-like shapes, adding Indian Ink to see how it would blend, dabbing away drips furiously and blowing through a straw to make use of the puddles of paint forming on the surface of the paper. At the end of 20 minutes I was exhausted! I couldn’t believe how much fun it was but felt to have been on a knife-edge throughout. The following day I came back to work on the painting and sat looking at it for about half an hour. This may be an entirely wrong decision but I felt I couldn’t touch it! I want to just leave it as it is because it emerged out of pure inspiration and that hasn’t happened to me before! No doubt this is the magic of watercolour! I’ve really enjoyed using a different format and can see how important it is to make decisions about this kind of thing as part of the preliminary work. The extended landscape shape emphasizes the outreach of the huge branches and I think adds to the power of the image. I would like to do some work on the wonderfully vertical trees of the forest and the success of this image has given rise to some new ideas. Painting 2 was a ‘blast’! I wanted to create an image which would express the amazing assembly of shapes, spaces, colours, tones, patterns and joy which I see in a tree. The only way to do this, I felt, was as an abstract image. I wanted the painting to ‘sing’. In my many walks in the local woods there were some wonderful old pines where the ground has eroded revealing the incredible root structure. In contrast to the intricacy of this root structure is the uncompromising vertical direction of the trunk. So I began to play around with these ideas. I made no attempt to draw the root patterns but instead let the paint find its way over the page in a random design. I let my feelings for the image guide me throughout this painting and really enjoyed the unknown element. As well as paint I used some wonderful coloured inks as well as oil pastels. Because I wanted to emphasise the random nature of the roots, I used pieces of hessian garden bags and pressed this into the wet paint. When it was dry I removed the hessian and it left behind a wonderful array of random colours and shapes….just the effect I wanted! I love this painting … it expresses so much of what I feel for the tree. 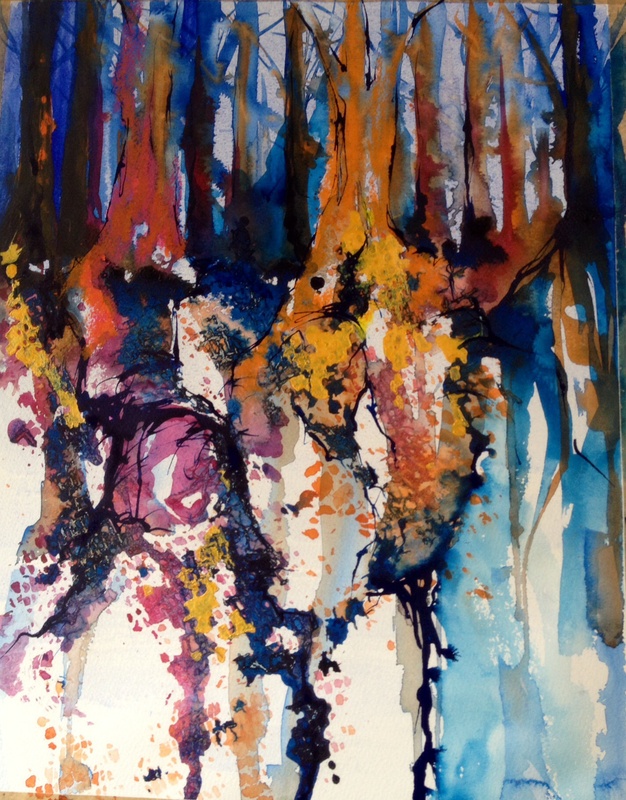 I like the figurative element remaining in the form of the trees but these too have an abstract quality. I have tried to show some figurative element in the roots but only very loosely as I didn’t want to disturb the abstract arrangement of shapes. I hope what I have achieved here is an impression of the magic of trees which stimulates the imagination of the viewer. For the first painting I wanted to work with the idea of ‘trees in the landscape’ and so I spent some time on composition studies in my sketchbook. The image I decided on was of a stump of a tree which is sending out wonderful vertical shoots of new growth. The studies are mainly focused on colour ideas. It took me some time to get the composition right and I did several studies which didn’t satisfy. So I cut out the bits which didn’t work for me and kept the sections which said something. This was interesting to do (…once I would just have binned the whole painting!) In doing this I found that new ideas for composition arose. A problem I kept finding was the loss of colour intensity as the painting dried. I love colour and wanted to express this in the image but I kept getting a very pale result. I wonder if this is because of the number of washes. The final painting is mixed media – watercolour, pen and ink, soft pastels and acrylic paint. I like the combination of the different media, particularly the look of the watercolour showing through the pastel. The picture has the ruggedness I was wanting and I like the colour scheme. The only section I’m not sure about is the foreground with the stump…perhaps the white is too strong?? Also, I think I should have brought in some strong texture there…it is an ideal area for it and would have added contrast. To some degree, the white acrylic sticks suggest texture.